It was last month that I “happened” on the Ukulele Underground Forum website. I was perusing the Marketplace when I saw a like new 2012 Kamaka HF-1 for sale. 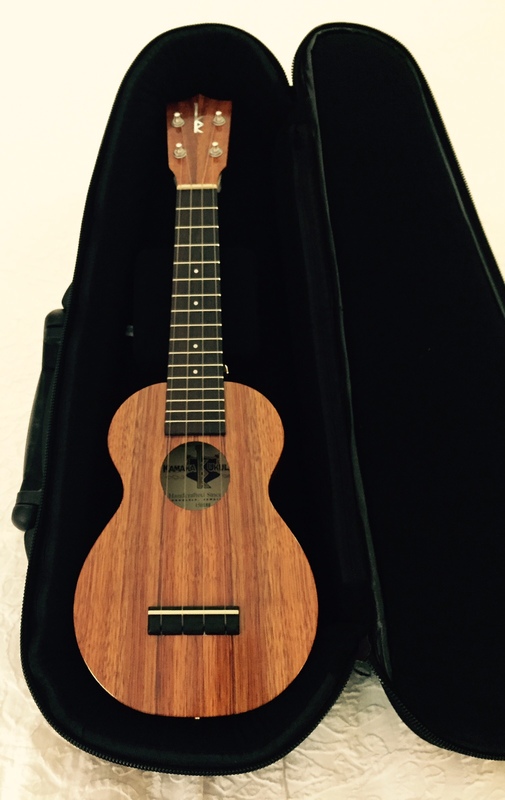 My favorite size ukulele is the soprano and the price was reasonable so I went for it. The uke was on the site for a whole 14 minutes before it sold! When it arrived it was just as Dave had advertised- like new with the Kamaka arched top hard case. This soprano was a little different as it had Gotoh sealed tuners on it, instead of friction tuners. That was fine with me as I had a few ukes with friction tuners which I find harder to tune; harder but not impossible. For the next month I bonded with my new, and only, Kamaka. I was not only bonding but falling in love with it, especially after putting Martin M600 strings on it. I love the way it looks, sounds and plays. You would think I would be satisfied but not when UAS (Ukulele Acquisition Syndrome) takes over. I was on The Ukulele Site (aka Hawaii Music Supply). I had never purchased anything from them but was aware of their stellar reputation and the fantastic set-up they do on every ukulele. I was looking at Kamakas and saw one HF-1 for sale but it had friction tuners. This didn’t appeal to me until I read that they were the Gotoh UPT geared tuners. They look like friction tuners but have gears in them. I like the friction tuner look and this particular ukulele had beautiful grain on it front and back. I pulled the trigger and asked HMS to add two strap pins as well as the Oasis Bright High G strings. Now came the hard part- waiting. Hawaii Music Supply (HMS) sets up each instrument which can mean up to a ten-day wait for it to ship. I was fortunate as mine shipped in just a few days. HMS mails their instruments FedEx two-day delivery so I received it exactly six days after I ordered it. This is fantastic service especially since I live on the East Coast in Virginia. Then came the moment of truth and a step of faith. I was just leaving out-of-town 30 minutes after receiving the uke. 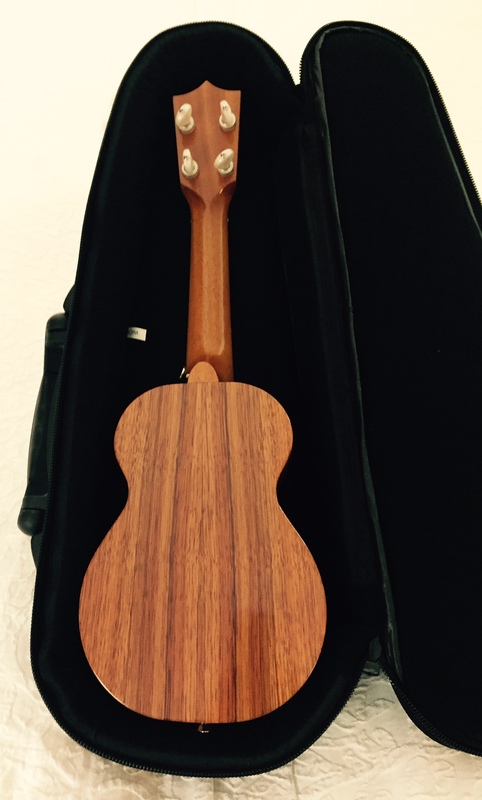 I was on the way to the Allegheny Ukulele Soiree in Altoona, PA. Should I take my original Kamaka, which I was very comfortable with, or tune the new one, strum it a few times and take a step of faith that it is functioning as it should? It was a bit of a risk as the strings were new and I prefer to have strings stretched when I am playing in classes etc. I decided to go for it so I packed it in my Fremont Carrying Case and off we went. First- It looks spectacular. I love the grain and the way it feels in my hands. Second- It has beautiful tone and it isn’t close to being broken in. The Oasis strings sound great on it. Third- It plays as smooth as silk. This is the first instrument I have purchased from HMS but it will not be the last. More on that in a moment. Fourth- I am in love with these tuners! Every uke should have these on instead of the old style friction tuners. They are a joy to use and most of all easy to fine tune. 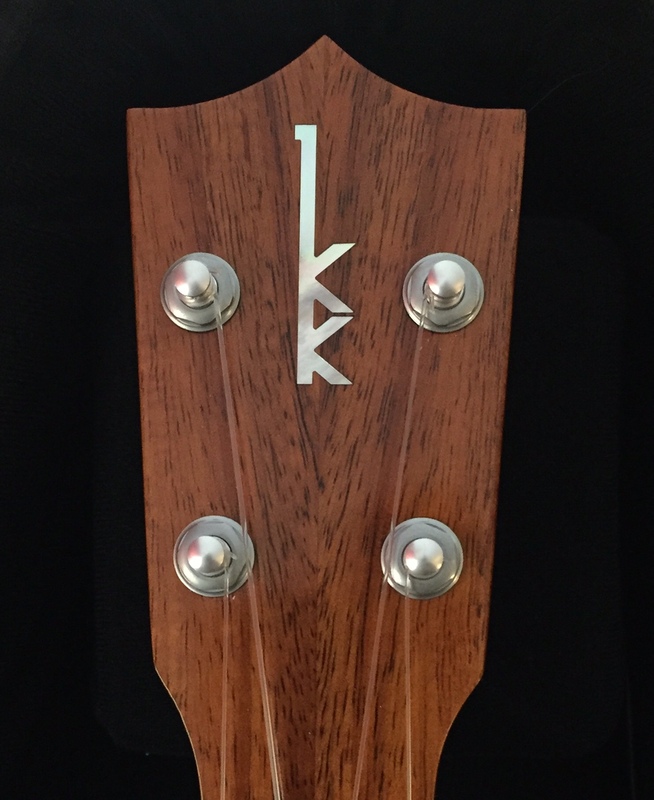 Thank you Kamaka for making these standard on your ukes that come equipped with friction tuners! Fifth- HMS put two strap pins on and I love being able to use a strap with this uke. I use the Uke Leash that comes with leather tabs on each end. It connects just as a guitar strap would but it is thinner and a joy to use. All in all this has been a very positive experience! The service was what I expected as I had heard so many good things about HMS. I love this ukulele and am really glad I brought it to the uke fest, which is tomorrow. Now I am on the lookout for a Kamaka Pineapple in a soprano size, the HP-1. I am checking the HMS site daily to buy it and have it set-up exactly like the HF-1. I am also blessed to play a ukulele built-in Honolulu, Hawaii. I was born 62 years ago in Honolulu. Fitting, don’t you think?